Difference between revisions of "07-401"
* [http://www.math.utoronto.ca/shub/mat302S.html 05-302] with Mike Shub. * [http://ccnet.utoronto.ca/20069/mat301h1f/ 06-301] with Lindsey Shorser. Agenda: (Groups,) Rings, fields, groups and some of the most famed no-go theorems of algebra and geometry. Classes: Wednesdays 6-9PM (OMG) at Sidney Smith 1086. Instructor: Dror Bar-Natan, drorbn@math.toronto.edu, Bahen 6178, 416-946-5438. Office hours: by appointment. Teaching Assistant: Chao Li, chaoli@math.toronto.edu. Office hours: Tuesdays 12:00-2:00 at the Math Aid Centre, Sidney Smith 1071. Undergraduate Course Descriptions at the Faculty of Arts and Science. 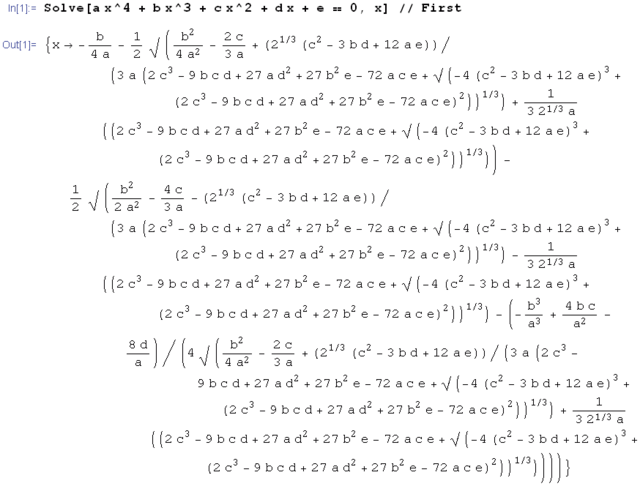 Solving The Quartic With Mathematica. Read more!